Start reading Beneath the Mother Tree on your Kindle in under a minute. On Moondarrawah, a small island off the coast of Queensland, lives a small tight-knit community. Everyone knows everyone else’s business but, mostly, people respect each other’s boundaries. For Ayla, the island has always been home. She left for a while to study but soon returned. Her grandfather, known as Grappa (a name the community finds fitting) is filled with the Irish mythology shared with him by his grandmother. Grappa hears a flute being played, he’s sure it’s the Far Dorocha, the dark servant of the faery queen returned to cause trouble. He hastens to the Nor Folk Tree to ask protection for Ayla. Two strangers have moved to the island. Riley and his mother Marlise have moved there following the death of Riley’s stepfather. Marlise is an entomologist, while Riley is the mysterious flute player. A series of strange deaths have the locals wondering: are they connected to the strangers? Part mystery and part love story, this novel also draws on Indigenous history and Irish mythology. Ms Cameron has written a novel in which these elements work together to demonstrate connections between people and place, between different perceptions of reality and ownership. Of the major characters, Marlise has secrets, Riley seeks answers, Ayla feels like she doesn’t belong. The island has history, as do the people who live there. The past is never far from the surface and the present is complicated. The environment is also important, and Ms Cameron describes the setting beautifully. The Mother Tree is central to the novel: important to both the Indigenous people and those of Irish heritage. There’s magic here, both in the story and in the telling of it. This is a novel to read and (in my case at least) to reread. This is Ms Cameron’s debut novel: I hope it is the first of many. It's hard to believe this is a debut novel. The writing is very assured, the premise original and the atmosphere evocative and mystical. Set on an island off the SE Queensland coast with a small tight knit community, the balance of the island is disturbed when two strangers arrive. Marlise and her 20y old son Riley, mourning the death of Riley's stepfather have left their home in the rainforest and moved into an old house on the edge of a mosquito infested swamp swamp. Marlise is an entomologist who studies mosquitos so this is paradise for her but not so much for Riley who has had a very sheltered and lonely upbringing in the rainforest. Wandering around the island, Riley's beautiful flute playing soon catches the attention of Ayla, a young girl who's Irish grandfather warns her that he is the mythical Far Dorocha, servant of the Faery Queen of Irish folklore come to enchant her and steal her away. Soon deaths and strange happenings occur, disturbing the equilibrium of the island's community. The combination of Irish folklore with indigenous beliefs and the overarching concept of the island's mother tree protecting them all works very well in this novel. The descriptions of the island's plant and animal life and the smells of the forest and the sea all feels very earthy and elemental. Ayla is forever rescuing animals and has grown up to love the island and become a part of it. She has been infused with her grandad's stories all her life but also with the stories of the lands first people told to her by her Aboriginal friend Mandy and her relatives. Riley is an innocent, naive boy who knows little of the world and has been overprotected and dominated by his mother who has secrets to hide and as the book goes on becomes more and more unbalanced. It's lovely to watch him fall in love with Ayla and feel the stranglehold his mother has on him loosen. Ms Cameron has successfully woven a wonderful tale steeped in myths and magic with one of romance, nature and madness. This review was based on a copy of the book provided by the author. 5.0 out of 5 starsAn impressive debut novel. Beneath The Mother Tree is the first novel by Australian author, D.M. Cameron. The small community on the island (Moondarrawah) watches with great interest as Marlise, tall and beautiful, arrives in a removals truck, with all her worldly goods, to move into the old Johnston place by the mangrove swamp. Some are more welcoming than others. Many believe the Johnston house is haunted, but its location is perfect for Marlise’s entomological research. But Grappa is more concerned about the raven-haired young man whose flute music seems to have cast a spell over his granddaughter, Ayla. Grappa grew up with his Irish Gran’s tales of folklore and Fey, and he’s sure this black-haired creature is the Far Dorocha, the one who tried to tempt his Nettie away from their fledgling marriage. He needs to make sure she realises the danger this creature poses. Ayla was practically weaned on Grappa’s stories about the Nor Folk and their connection to her favourite place on the island, at the foot of the giant fig, but she’s beginning to think that he has really lost it this time: he’s raving about spells and menace and he has even attacked her new friend, Riley. Has he been drinking even more than usual? Cameron sets her tale on a tropical island off the coast of Queensland and her descriptions easily evoke the heat and humidity, the mosquitoes and the sometimes-magical quality of setting. While the support cast are characters easily recognisable to anyone who has lived in a small community, initially Riley seems unbelievably naïve, while Marlise’s overprotectiveness feels exaggerated. But patience and persistence yields a better understanding of this pair. Cameron's depiction of a psychopath with psychotic episodes, from both within and without, is very convincing. Similarly, she deftly demonstrates the delicate balance between gossip and goodwill in a tightknit little town. This is a story that begins rather sedately but builds to an exciting climax. An impressive debut novel. This unbiased review is from a copy provided by the author. 5.0 out of 5 starsA spectacular debut! Riley and his mother Marlise had recently moved to the small island of Moondarrawah after the death of Riley’s step-father. He hadn’t wanted to move and hated the old, broken down house they lived in. He also hated his mother’s cloying manner with him, almost as if he was still a small child. Her strange career and love of mosquitos wasn’t new to Riley, but he still didn’t feel comfortable with it. Ayla had lived on the island her whole life. She and her mother lived in their home together after Ayla’s father had been lost at sea a few years before. Her grandfather, whom she called Grappa, lived on his boat and Ayla was exceptionally close to him. His knowledge of the faery folk and Irish folklore had been a mainstay through her childhood and beyond. But when they heard the mystical music from a flute, Grappa was frightened for Ayla. It was the Far Dorocha and he was sure it would lure Ayla away from him and her island home. 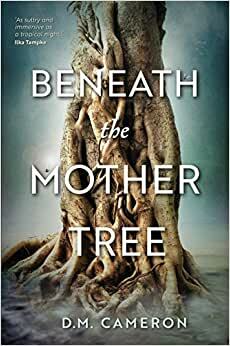 Beneath the Mother Tree is a spectacular debut novel with a stunning cover by Aussie author D.M. Cameron which I completely devoured! Unusual, unique and fascinating, the characters are well written; the plot filled with intrigue and evocative magic. Irish folklore blended with Indigenous culture to make a book like one I’ve never read before. I can’t wait to read her next. Well done Ms Cameron! Highly recommended.